We have been having quite a bit of fun at my house. Since the boys got out of school, we have been packing all kinds of fun in before Christmas. We are having to do some cleaning to get the house ready for some Christmas guests, but there is a lot of fun going on as well. Tuesday, we decided to celebrate the first day of the boys break by going to the movies. We decided to be festive and watch “Arthur Christmas.” It was cute and helped get our Christmas break off to the right start. After leaving the movie, we rushed to the grocery store to grab some ingredients to make this smothered chicken for dinner. It was a scrumptious meal. Jeffrey’s sister and brother-in-law joined us for the meal and a sugar cookie decorating session afterwards and everyone was in agreement that the chicken was excellent. Jeffrey even stated that it needed to be on a heavy rotation. 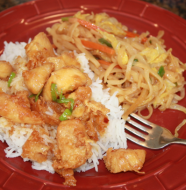 When I first came across the recipe, I was intrigued by it because it had several of the components of my curry chicken minus the curry powder. I was a little concerned because it didn’t really have any any herbs or spices other than salt and pepper, but between the 1/4 cup of white wine mixed with the cream of mushroom soup was phenomenal. 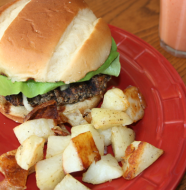 I think this is a great family meal, but it will also be used quite often at our house for entertaining. If beef wasn’t on the menu for Christmas this would be in the running. I am sure I will find a way to get it on our menu again soon and I know I won’t hear any complaints from the other members of the family. 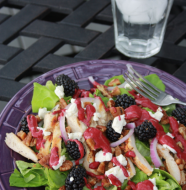 If you haven’t tried anything from my blog lately, you owe it to yourself to try this dish out as soon as possible! Season chicken generously with salt and pepper. Cook bacon slices in a large skillet until crisp and brown. Remove bacon and place on a paper towel lined plate. Brown the chicken on each side using the skillet used for cooking the bacon. (I left the bacon grease in the pan for browning the chicken.) 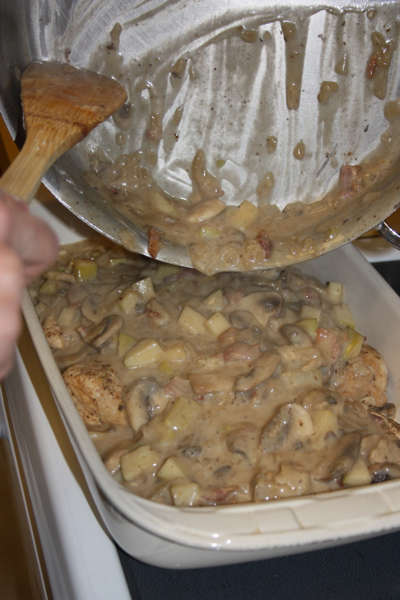 Once the chicken is browned on each side, place it in a large casserole dish that has been sprayed with non-stick cooking spray. Continuing to use the same pan used for the bacon and chicken, add the onions and cook until they begin to soften. (You can add olive oil or butter if needed.) 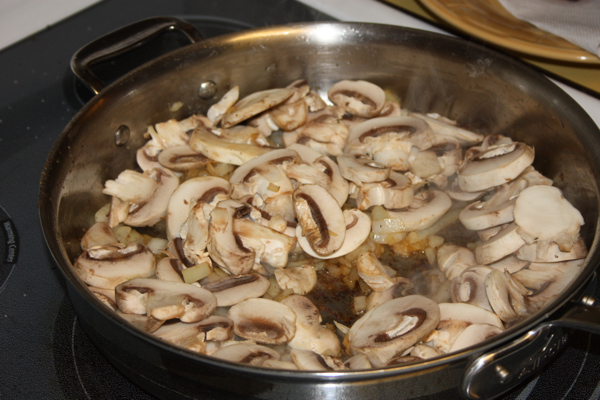 Once the onions begin to soften add the mushrooms and cook for a couple of minutes. Add the diced apples and continue to cook for about 3 minutes or until they begin to soften. Season with salt and pepper and crumble the bacon as you add it back into the skillet. Add the white wine, cream of mushroom soup, and shredded cheddar cheese. Stir to combine. Pour the mixture over the browned chicken. Place the chicken, now covered with the sauce, in the oven and bake uncovered for about 30 minutes or until the sauce is nice an bubbly and the chicken is cooked through. While the chicken is baking, bring some water to a boil and cook the spaghetti accordingly to package directions. 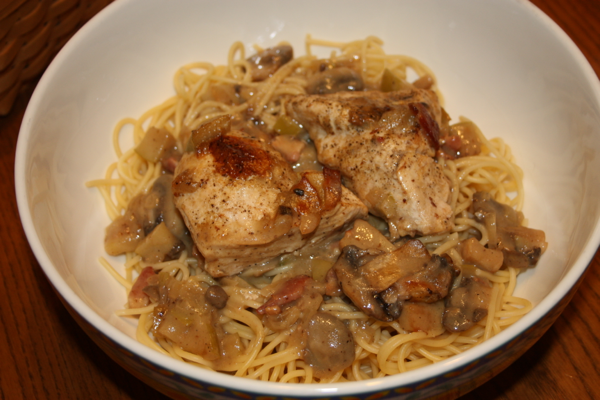 Serve the chicken over top spaghetti. Brown your chicken in the pan where you cooked the bacon. 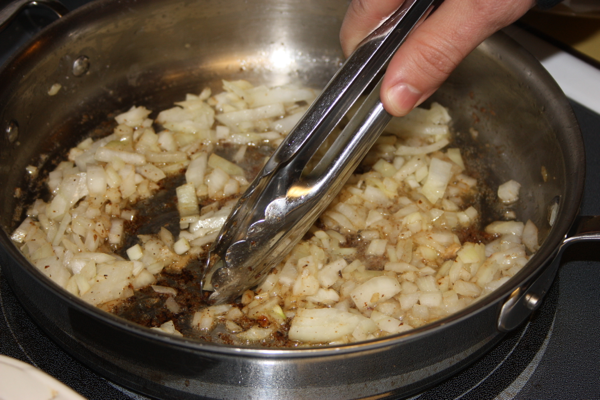 After browning your chicken, brown your onions in the same pan. 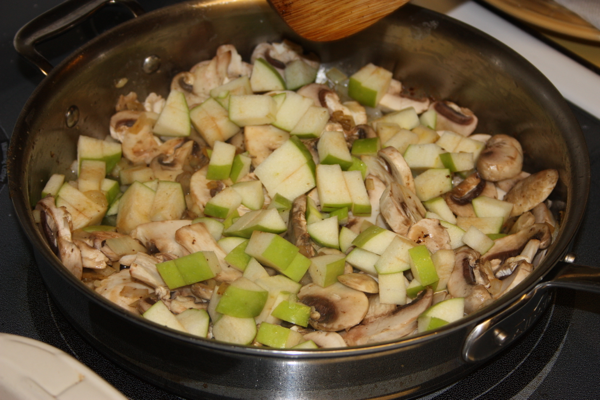 Add apples to your pan with the mushrooms. 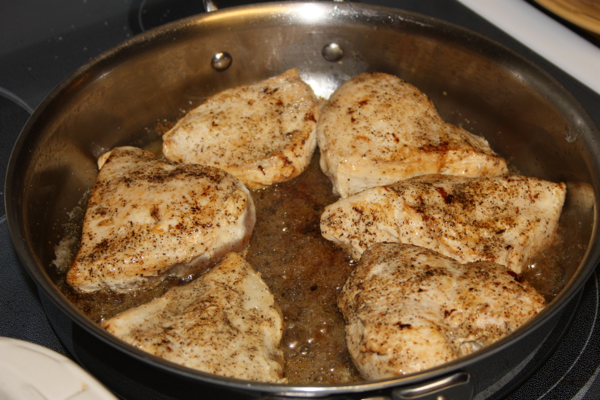 The chicken in the pan with the sauce being added to the dish before baking. One Comment on "Smothered Chicken"
Because I am not a mushroom fan I would of never made this dish, however with Dinah visiting she spoiled us and made this amazing dish. Dinah this is an awesome dish that is so different, but awesome.